Of the many stories of heritage I’ve heard in the past months, the one that has stayed with me the most is about seeds. When I traveled to Ramtha on the northern Jordanian border this November, I heard from locals that Syrian refugees had been arriving from nearby Daraa across the border. Fleeing terrible violence, many of them had brought almost nothing with them. What they had brought were seeds. It turns out that the city and surrounding villages of Daraa, an agricultural center and important trading crossroads in Syria before the war, was famous for its red peppers and small eggplants, both necessary for making makdous, a kind of pickled eggplant stuffed with peppers and walnuts and kept in oil, beloved across the Middle East, but particularly by Syrians. 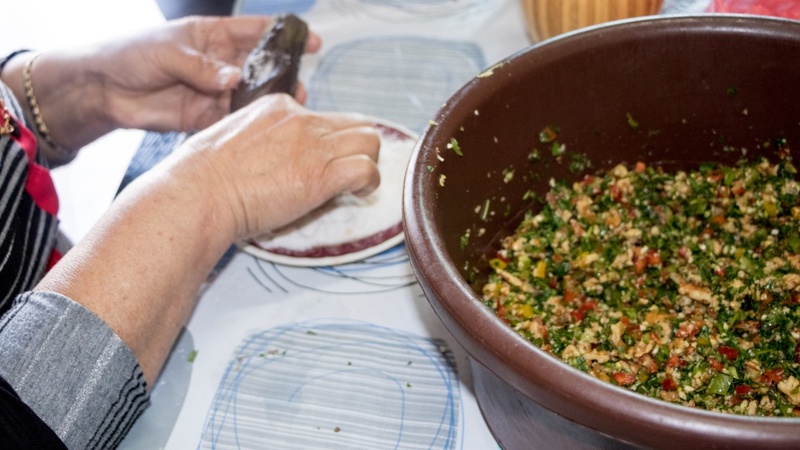 The eggplant and peppers of Ramtha in Jordan were considered too industrialized and so of lesser quality, and so Syrian refugees brought their own native seeds and began planting them in exile, so that they could continue making makdous that tasted like home. A local Jordanian woman who gave her name only as Intisar, and whose family had intermarried with Syrians from across the border in Daraa, explained that Syrians had become so attached to their native peppers that those working in the small factories in Jordan that ground Syrian peppers into sauce would, at the end of the day, scour the sides of the machines to see if any seeds had escaped in the process. They could collect them, bring them home and dry them on the roof, so as not to waste a single possible seed for the coming year’s harvest. Bringing seeds, then, is a way of holding onto home. I traveled to the so- called “Syrian market” in Ramtha, and sure enough, the entire entrance was taken up with rows upon rows of Deraa eggplants and peppers for sale. 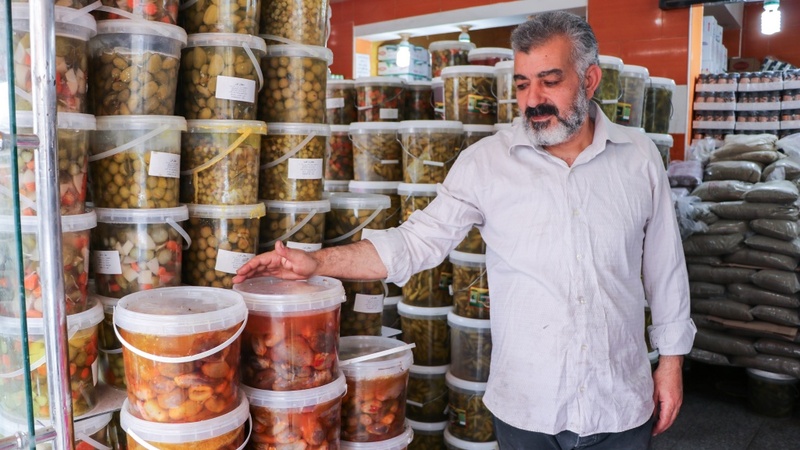 A Syrian from Hama who gave his name as Munther was selling enormous buckets of already made makdous. 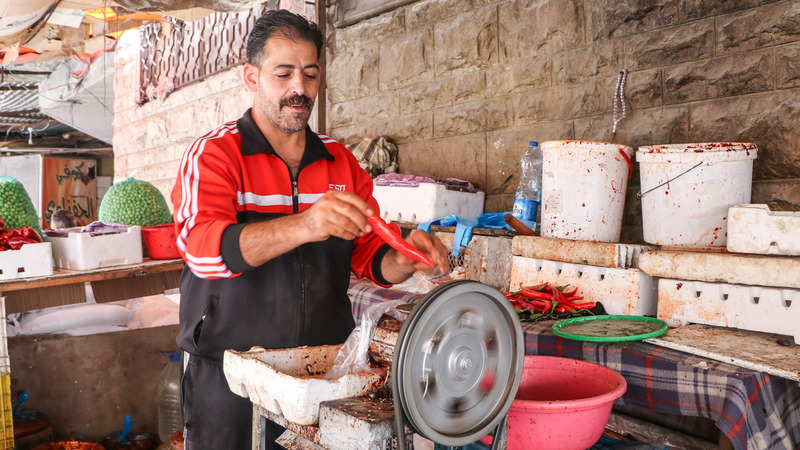 Men were grinding red peppers for the sauce so essential in Syrian cuisine. 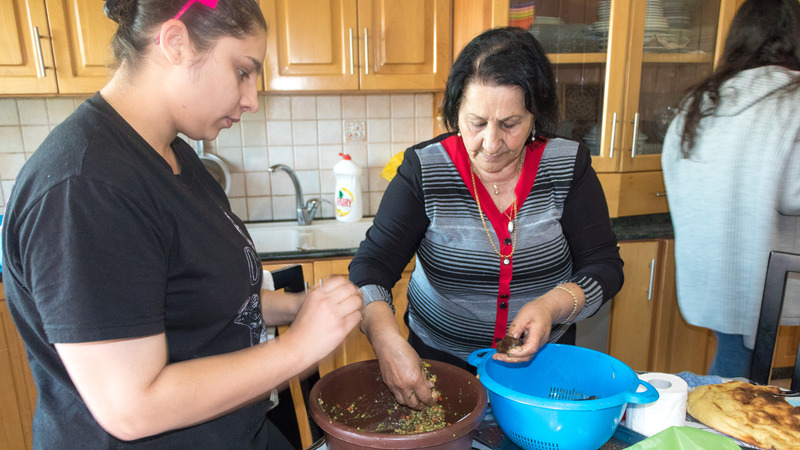 Like so many of the prized heritage dishes of the Arab world, makdous is made once a season and in community—mothers and daughters and sisters who gather to tell stories around the table as they do the collective work of stuffing and pickling the eggplants. For many in Deraa, nearly all of the ingredients, from the eggplants to the peppers to the olives used for olive oil, would originate in their gardens. “We called them jannah”, said Andleeb Mahamid, originally from Deraa in Syria but speaking from exile in Irbid, using the term in Arabic both for “garden” and for “paradise.”. She was the first woman to serve me makdous, and as we ate it she told me the story of her flight from Syria with her family, about the simple wedding she had in exile instead of the week-long ceremony she would have had at home, about her sixteen-year old brother, who took the sea route to Germany in the middle of the winter on a raft piloted by a man who knew nothing of the sea. The trip was supposed to take thirty minutes but instead it had taken seven hours, and no one in her family had slept that night as they waited for news. But he had survived. I listened to her stories, and together we dipped flat bread into spicy eggplants and oil. She had almost nothing from Syria in her new home. For the first time in her life, she had needed to buy eggplants from the market instead of simply picking them from the garden. But she had continued making makdous—a connection to the past—and she had made enough to last her and her family through the year. And I was reminded of how much hope is possible from something the size of a seed. 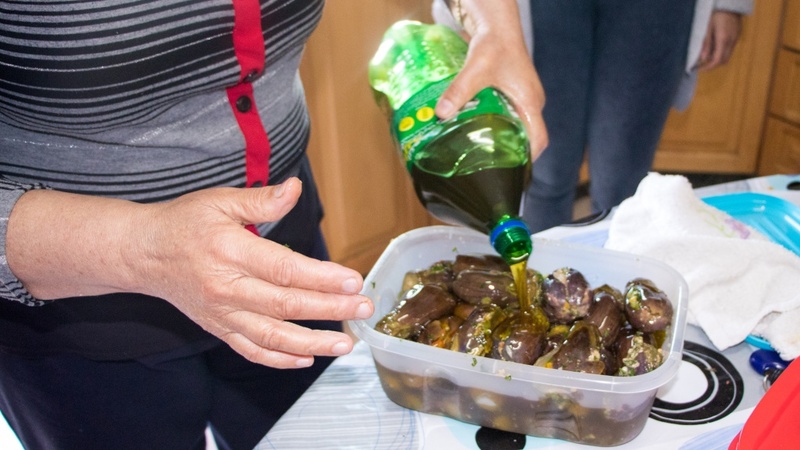 When I returned to Jerusalem eggplants were still in season, and so I traveled to the Dheisheh refugee camp outside to learn to make makdous from my friend Lana Ramadan and her aunt Maram. The recipe is below, with adjustments for the Daraa recipe. 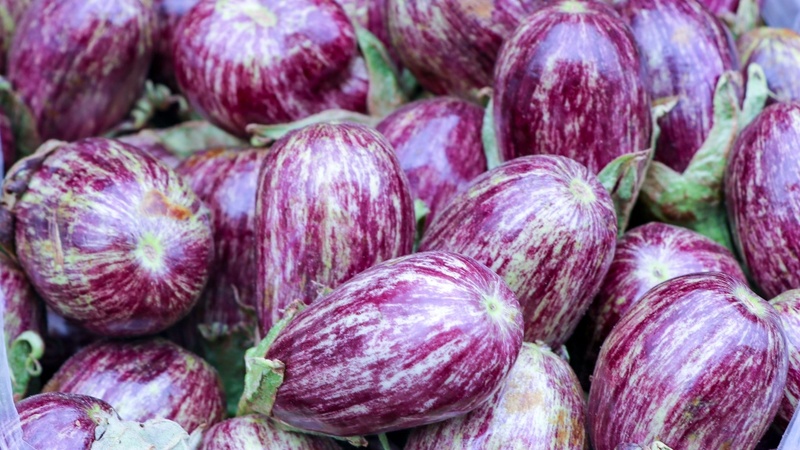 Choose very small eggplants suitable for makdous. Cut off the stems. You may leave the small green caps as decoration if you would like—they can be removed with a knife before eating. Wash and set aside. Boil the eggplants for about 10 minutes, until they are cooked but still firm when pressed. Remove from the water and allow to cool. Take each eggplant and cut a small slit along the side. Fill the slit with 2-3 pinches of salt, depending on the size of the eggplant. Close the eggplant. Place the eggplants in a colander with something heavy on top and a bowl underneath to catch the juices. Allow the eggplants to dry for 1-2 days. After 2 days, you can prepare the filling. Begin by crushing the walnuts with a mortar and pestle. The amount of walnuts used varies greatly by family. 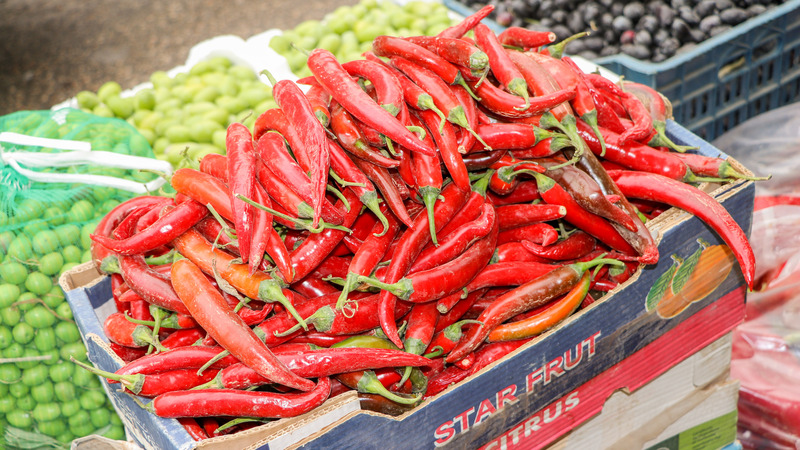 Chop the peppers until small, mixing hot and sweet red peppers to taste. Mix in the bowl with the walnuts. Add the garlic and parsley. If you like, add shatta—the spicy red pepper sauce that gives it kick. Some people also add minced carrots at this stage. Salt generously. Pour the juice of two lemons on the filling and stir. Take each eggplant, open by the slit, and stuff with the stuffing until full. them to set for one week before eating. Makdous is generally eaten for breakfast or a snack, with flatbread. Notes: The Daraa version differs slightly. Andleeb uses fewer walnuts, and only uses the spicy peppers of Daraa, with a few sweet ones added at the end to round off the taste. Most importantly, she also allows the stuffed eggplants to drain for a second time after step 9—placing the stuffed eggplants under something heavy—for an additional 4 days before the final oil is added. Finally, she puts the makdous in vegetable oil, not olive oil— olive oil now being prohibitively expensive. For more on the unique ways Syrians and Iraqis are saving heritage, read this recent article in the New York Times about the Mosaic Stories.